As efforts to expand patient access to health records grow, so too does the burden on HIM departments to supply and manage that information. In January 2016, the Office for Civil Rights (OCR) issued guidance to clarify patients' rights to their health information. How has this guidance affected the release of information (ROI) process on both the front and back ends? According to experts, it's an evolving issue that touches on cost, compliance, and workflow concerns. HIM departments that are actively addressing the issue will be in the best position to tackle the challenge. This article offers strategies for solving seven common ROI concerns and how they may be exacerbated as HIM departments grapple with patients becoming more involved in their care. It details why patient engagement is actually an end goal all parties should cheer on (and can benefit from)—whatever complexities it may throw HIMers' way in the short term. While the HIPAA privacy rule actually provided patients with access to their health records years ago, OCR issued the January clarifications because it found through recent studies and its own enforcement that "far too often individuals face obstacles to accessing their health information." Those obstacles vary by health organization but can include varying record fees, long wait times, and disputes over precisely who (other than the patient) is allowed access to a particular record. Marty McKenna, CEO of Verisma Systems, an ROI vendor that offers a cloud-based solution, believes the clarification has been helpful to health care organizations. "This guidance is pushing the health care industry in the right direction," he says, even if it causes short-term ROI process shifts. "There was no way to increase the distribution of patient data and not change processes, so it had to happen. "We need to streamline the processes on the front end," he adds, noting that the automation that began in the health care industry a decade ago is now more crucial than ever and, in fact, will happen faster now. According to Katherine Downing, MA, RHIA, CHPS, PMP, senior director for AHIMA IG Advisors, the increasing calls for greater patient access to their health records should actually help to streamline the ROI process—if patients can get to their full record via technology. "Larger health care organizations like hospitals are more likely to provide any access than a small physician practice," she says. "The cost can vary by vendor, but it is an important investment to maintain." Kim Murphy-Abdouch, MPH, RHIA, FACHE, a clinical associate professor at Texas State University and an expert on HIM practices surrounding patient access to paper and EHR records, says the greater issue for HIM departments is that many workflow processes have already changed up front, outside of the ROI department, but not necessarily within the ROI process. "When a patient comes into the hospital (or the doctor's office) under meaningful use, they are often provided a summary of their care and discharge instructions. So we have more information going to patients in real time than we have in the past," she explains. "Where I see the disconnect is that when providers are taking care of the patient, they're freely handing information to them. But when that same patient comes back and requests a copy of their records, they're treated in a different way even though for the patient, it's no different." With EHR technology, patient portals, and even regulations requiring faster and more complete patient access to medical records, Murphy-Abdouch says the health care landscape has changed. However, the ROI process in many hospitals hasn't adapted. To provide patients certain information one day and then charge them fees and make them wait for information the next day doesn't line up, says Murphy-Abdouch, who notes that it's forcing HIM departments to reconsider how they handle patient requests. "I think there's a real opportunity for HIM professionals to rethink how they manage patient access to their health information," she says, noting that this relates solely to patient information requests, not those from third parties. "I anticipate in the long run there'll be fewer requests for patient information after the fact because patients are given more information in real time." According to Rita K. Bowen, MA, RHIA, CHPS, SSGB, vice president of privacy, compliance, and HIM policy for MRO, this is the most common ROI challenge. Although the recent guidance from OCR clarified parts of the patient access issue, Bowen says it may have complicated another. "The January 2016 patient access guidance from the OCR made it very clear that there should be nothing hindering a patient, their personal representative, and/or their designated representative from obtaining their medical record," she says. "However, there was confusion regarding the right of access for a patient's personal representative." While HIPAA defines a personal representative as a person authorized by the patient under law to act on their behalf in making health care­–related decisions, including parents of minors and executors of the estate for deceased patients, Bowen says HIM departments often deal with incomplete or invalid requests from people claiming such representation inappropriately. "Many in HIM have received requests for access from parties claiming to be the patient's personal representative despite not having health care decision-making power for the patient," she says, noting that HIM departments should ensure appropriate documentation before releasing information. "Regardless of what these requesters might claim, only the patient and the patient's personal representative have the right to authorize the disclosure of the patient's PHI [protected health information]. Therefore, if a requester is not the patient and does not meet the definition of a personal representative, his or her request must be accompanied by an authorization signed by the patient or the patient's personal representative." According to McKenna, greater patient access adds up to higher costs for hospitals. "Revenue is going down but patient access and the cost to provide that is going up," he says. "This means facilities need more staff to handle the additional needs." Because hiring staff isn't necessarily cost-effective or feasible, McKenna says many health care facilities are exploring automated options. However, that's not always an easy solution. "Years ago, it used to be easy to outsource, but facilities cannot do that anymore," he says. "In my estimation, it will be difficult for pure copy services to handle ROI in a budget-neutral way." If increased ROI requests are straining staff, Bowen says HIM departments may want to consider outsourcing at least some work. In that case, "focus on quality and patient satisfaction when researching potential partners," she says. It's a cross-functional problem, says McKenna, who stresses that compliance concerns can't be overstated. "The compliance officer needs to be involved, as does finance, billing, IT, and others. The HIM director needs to become the quarterback and build a cross-functional team that can manage this strategically at an enterprise level," he says. Hospitals outsourcing some or all of their ROI functions should investigate a potential disconnect, too, Murphy-Abdouch says. "Sometimes here, too, there's an outside disconnect between the HIM hiring manager and the ROI company," she says. "You should make sure that the procedures and processes that the ROI company are using are consistent with how the HIM director would want their client treated—or want their client requests processed." When various types of ROI requests are being received, Bowen says HIM departments should first determine their exact nature. "Understanding the various request types received by your facility can assist in determining how to best respond to these requests and understand what workflow processes may need modification," she says. According to Murphy-Abdouch, prioritizing items can be especially helpful when sorting through various types of ROI requests. "If I'm in my HIM workflow and I have 52 releases to respond to today, then the first 10 will be those that are from the patient," she says. "I think putting a priority on client requests vs other third parties is key." When analyzing ROI workflow, McKenna advises hospitals to take a tailored data approach, ensuring they're able to deliver the minimum necessary at the right time to the right person. "This requires an understanding of the purpose of the request," he says. Murphy-Abdouch agrees, noting that HIM departments can improve workflow by reviewing policies on the front end and providing patients with only the data they really need. "I would expect that most health systems would have a standard record set that they would provide upon a patient ROI," she says. "If I were in charge of writing the policy, I would exclude an entire medical record from the choices a client might make on a ROI request form." Because most patients are unfamiliar with the contents and girth of an entire record, Murphy-Abdouch says HIM professionals can take it upon themselves to offer options that can better guide them to the types of information they're most likely to find useful. "Most patients don't need all of their hospitalizations, medication records, nursing notes, and all the detailed documentation," she says. "More likely, they'll need a discharge summary, perhaps their history and physical, a procedure report if any were performed, and perhaps a final discharge note from the doctor. And that to me would be more cost-effective and timely for the health system if that's determined in advance as well as providing the patient with the information that's really useful for them." When it comes to ROI requests from third parties, McKenna says continuity of care is a massive issue. "Standards need to get better, and they will in time," he says. 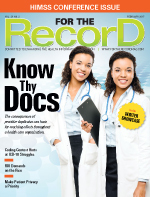 "Meaningful use has pushed the industry forward, which has engaged and galvanized everyone. That will continue to happen as more requestors enter. Hospitals need to understand that this is a new world of connected health care and that they need sound strategies in place for sharing sensitive patient data." Bowen agrees, while noting the importance of timeliness. "When sending information to third parties, understanding timeline requirements is important on all fronts," she says. "Providing health information for continuing care processes should be the top priority." Organizations must keep in mind the enterprise nature of accessing electronic PHI, McKenna says, noting that the process involves more than just the clinical medical record. "Health care facilities need to realize it's not just the medical records they are dealing with," he explains. "There are many other aspects to ePHI that must be handled with a team-oriented approach, including business offices, radiology, and information across care settings. It's critical to have a broad sweep perspective." McKenna says hospitals should not be afraid to release ePHI to the cloud but compliance and security must be top of mind. "Essentially, we need to return to the basics with a new technology platform," he says. "Focus on compliance; ensure HIM departments are releasing the minimum data necessary, to the correct requester, in a timely way; and manage ROI in a very strategic manner." When releasing ePHI, Bowen says it's important to be consistent and attentive while vetting cloud providers. "Due diligence is key," she says. "Formalize your assessment process to assist in the review findings." While patients gaining greater access to their medical records may cause HIM hiccups in the short term, the long-term benefits are undeniable. "Involving patients in the management of their health encourages greater patient participation in care," Downing says. "It also increases the integrity of the health information stored by our health systems because patients will be the first to tell you if the information is incorrect. Patient-focused models are said to lead to better patient outcomes, more compliance with treatment regimens, increased quality of care, and lower health care costs for all." McKenna agrees, noting that health care organizations engaging with patients is a win-win situation. "Digital access to medical data allows the patients to take ownership and control of their health, which then enables the health system to provide better care," he says. Greater access to medical records is only a starting point for patient engagement, says Jim Bailey, president of BACTES Imaging Solutions. "Information in medical records can be helpful, but it's not enough," he says, noting that patients need a combination of education and awareness tailored to their needs and overall health (including factors such as diet, social environment, relationships, and exercise) to reap the full benefits of patient engagement. "For health care facilities, having better educated, more informed patients can improve outcomes, reduce waste, and avoid potential errors." According to Downing, patient portals eventually may provide this one-stop shop for patients. "Meaningful use put pressure on health care organizations to get patients to the portal," she says, noting that the main issue thus far has not been getting patients to log in but rather the fact that organizations are not providing a full view of the medical record. "Accessing labs is a one-and-done, print-it-off event, with no need to go back to the portal," she says. "Having the full medical record with physician and nursing notes provides patients a view of their health that looking at test results cannot provide."